As GM prepares to file for bankruptcy, here is a look back at the 10 biggest missteps that brought America's greatest company to its knees. 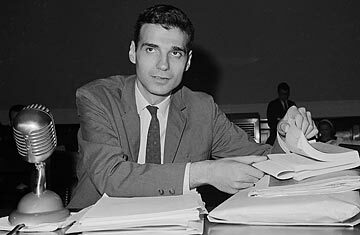 In 1966 GM hired private detectives to shadow Ralph Nader, who had emerged as GM's principal public tormentor with the publication of Unsafe at Any Speed. Nader's book had excoriated GM for producing the Chevrolet Corvair, a car that failed to meet even the minimal safety standards of its time. To this day, GM defends the underlying safety of the Corvair, but the company has never quite mastered the art of building smaller cars that could excite the public  and protect the company from spikes in gas prices. The revelation that GM was digging up dirt on Nader dealt a serious blow to the company's image and prestige and also fostered the impression that GM wasn't interested in safety. Chairman James P. Roche's apology in front of a Senate Committee didn't cut much ice. See pictures of American muscle cars in movies.